Mandel Vision’s first blog created, entitled: Mandel Vision: Eyes on a Clearer World. 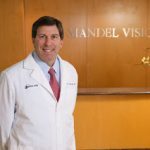 In his blog, Dr. Eric Mandel will share information about LASIK as well as general ophthalmology. Click here to visit our blog page.